Candy corn. Caramel. Red candied apples. Nothing shrieks “Halloween!” more than these fall-time flavor favorites. In the meantime, let’s tip our hats to buttery, tasty caramel compliments of this Halloween treat recipe that’s sure to scare-up the taste buds! ♥ If you’re a wee bit shy of walnuts, try substituting Texas pecans. Yee, Haw! 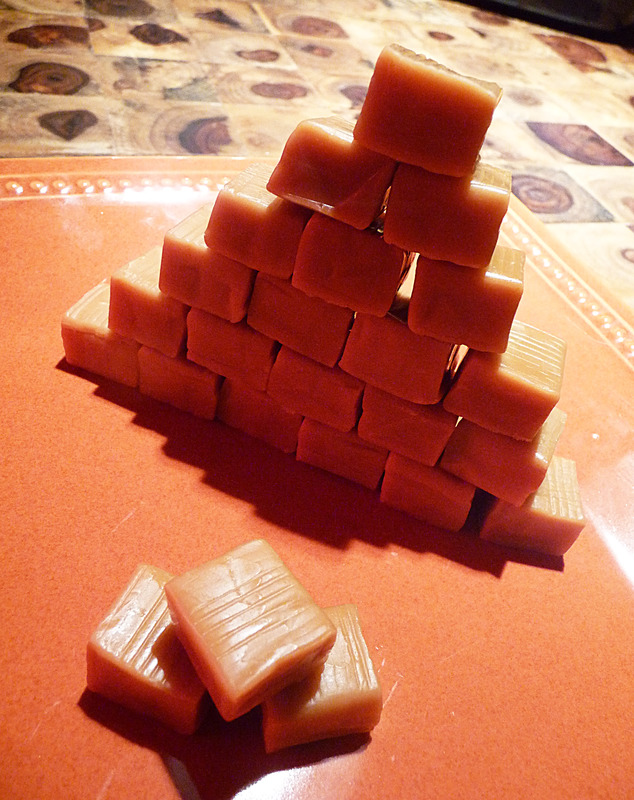 ♥ Since I’ve made this several times I tried melting the caramels in the microwave in 20-30 second intervals and I think i like that method best. 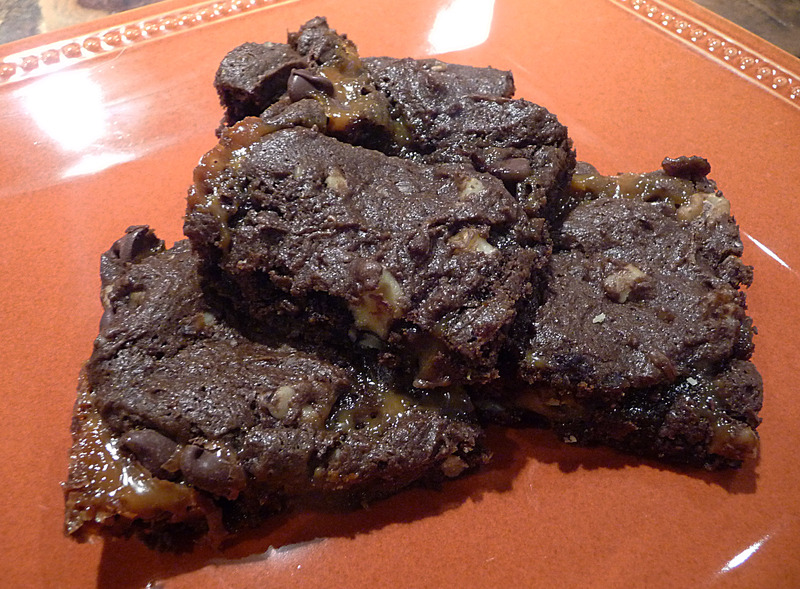 ♥ I added a sprinkling of toffee bits to the recipe which sent my tastebuds into outer orbit. ♥ We cut our bars after they cooled. 0. Preheat your oven to 350°F. 1. 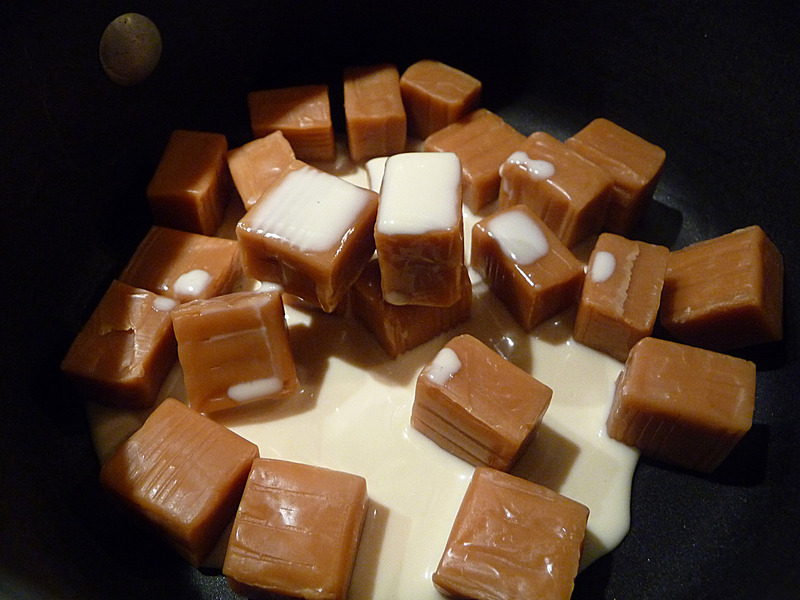 In a saucepan, cook the caramels and 2 tablespoons of the evaporated milk over low heat until the caramels are melted. Cover and turn off heat. 2. In a medium-sized mixing bowl, combine the remaining evaporated milk, the cake mix, walnuts, and butter; mix well. 3. Spread 1/2 of the cake mixture in a greased 13″ x 9″ x 2″ baking pan or ceramic dish. 4. Bake in your warmed-up oven for 10 minutes. 5. Remove the delight-in-progress (D.I.P.) 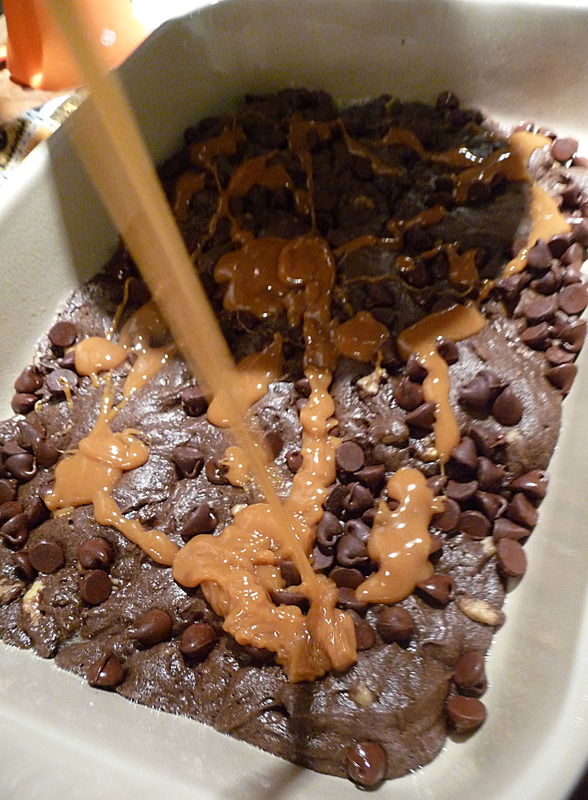 from your oven and sprinkle the chocolate pieces over the hot baked crust… and drizzle the caramel mixture atop. Drop the remaining cake mixture by teaspoons over “all.” If there are some bare “holes,” no worries; they will fill-in during the final bake. 6. Return to your 350°F oven and bake for 20 minutes more or until an inserted knife comes out clean. 7. Remove the magic from your oven … cool … then cut. Sha-Zam! 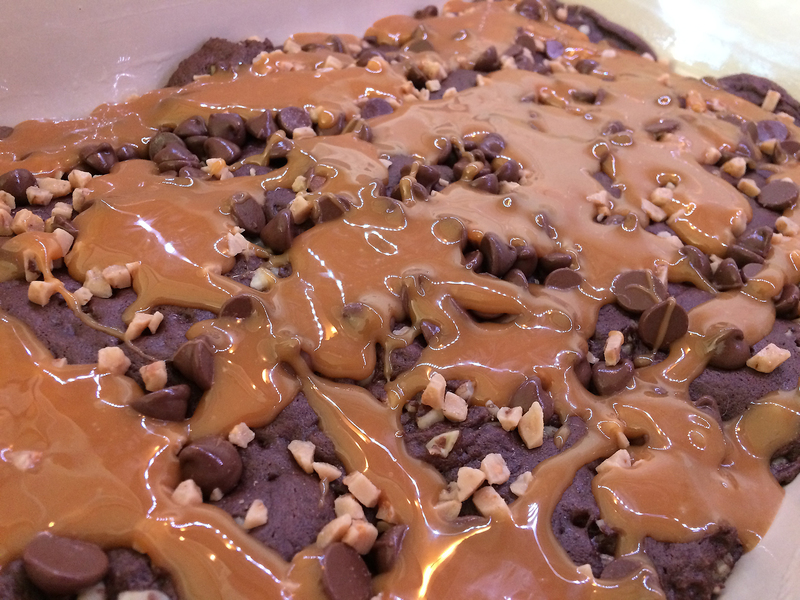 You just made something they’re gonna love twice; they’ll love the brownie treats plus love you for making them! Now sit back and relax with a brownie or two for a job well done! 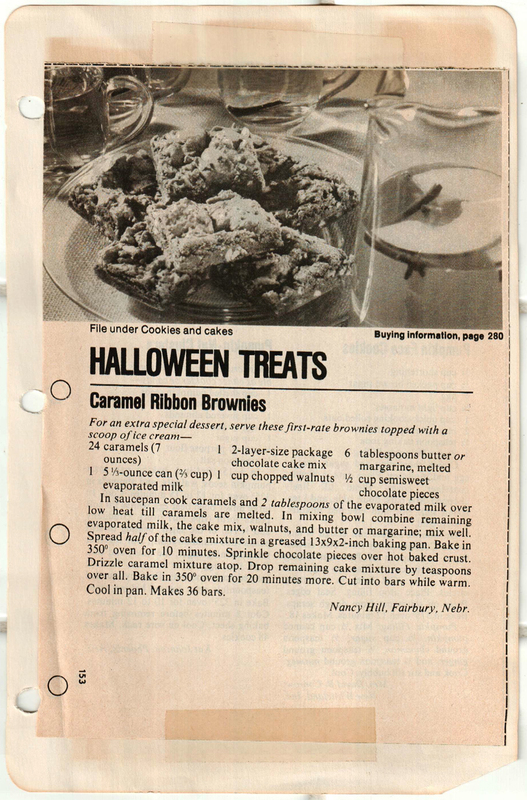 Below is a scan of the original recipe Mom had in her cookbook!